Description: The Frog Holder features a comical green frog attached to a ring (or branch). He looks like he is holding the ring with his large webbed feet. You can use beads for eyes, but I recommend you try to find some plastic eyes, preferably with stems and washers. The finished size is approximately 16 inches, from the top of the eyes to the bottom of the ring. Step 1: Cut 14 cords, each 4 yards long. 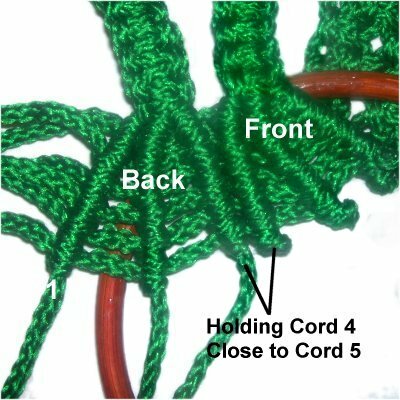 Prepare the tips to prevent unraveling while you work on your Frog Holder. 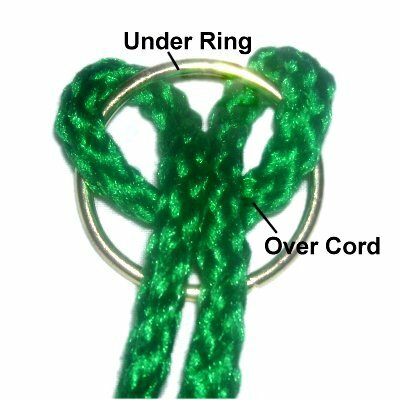 Step 2: Attach one 4-yard cord to the top of a ring with a Reverse Larks Head knot (see information below). ends heading towards the back of your project board. 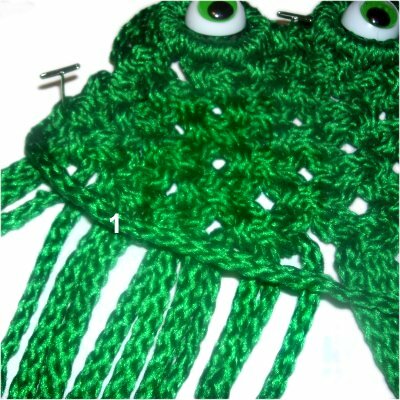 Step 3: Should you decide to use bead for the eyes of your Frog Holder, slide one onto both halves of the cord. 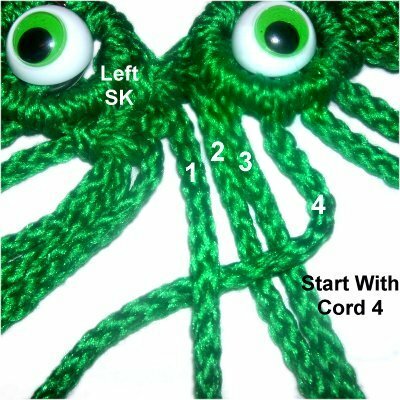 For a plastic Frog eye, wait until all the cords are mounted (step 4). 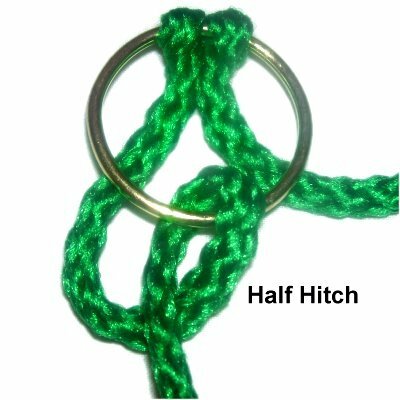 << Attach each end of the cord to the bottom of the ring with a Double Half Hitch (a single Half Hitch is shown in this image). Step 4: Attach another cord to the right side of the ring with a Reverse Larks Head knot. Make sure the folded area is heading outside the ring. This is the opposite of the first one, which was heading towards the inside of the ring. 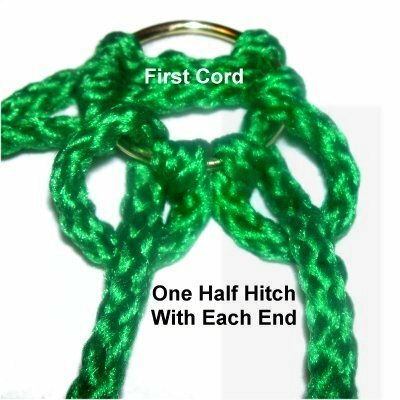 Tie one Half Hitch with each end of the new cord onto the ring, resting beside the Larks Head knot. This image shows the ring positioned sideways. Step 4, continued: Attach one more cord to the right side of the ring in the same manner. Attach two more cords on the left side of the ring. This will give you a total of five cords attached to the ring. 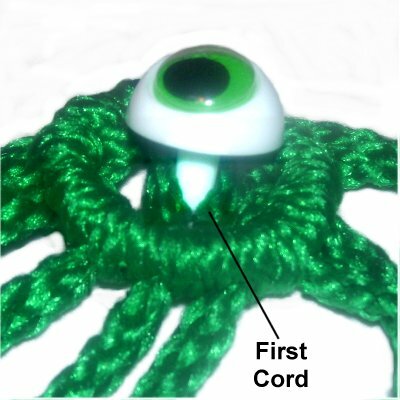 Step 4, continued: Place the stem of one eye through the two segments of the first cord (inside the ring). Turn the ring/eye over, so you are working in the back. 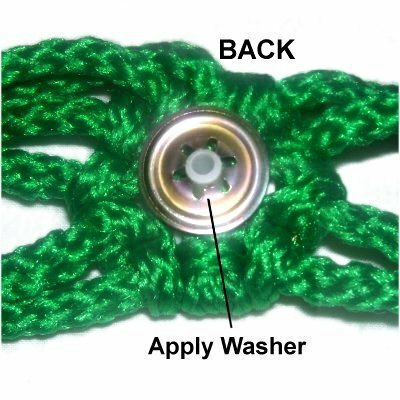 Apply the washer to the stem. Make sure it's pushed down as far as possible. 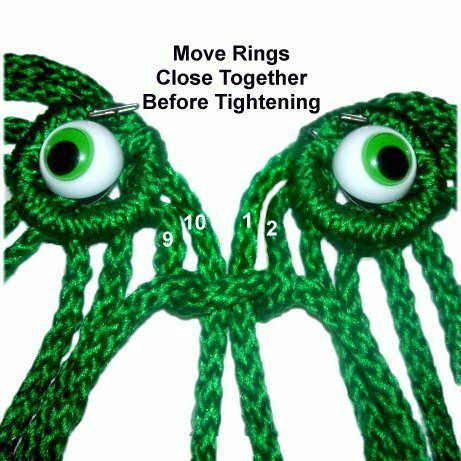 Step 5: Repeat steps 2 - 4 to make a second eye/ring design for your Frog Holder. Step 6: Place the two rings side-by-side, giving yourself a little room to work. Mentally number the 10 cords on each ring (left to right). Use cords 9 -10 from the left ring, along with cords 1 - 2 from the right ring, and tie a Square Knot. 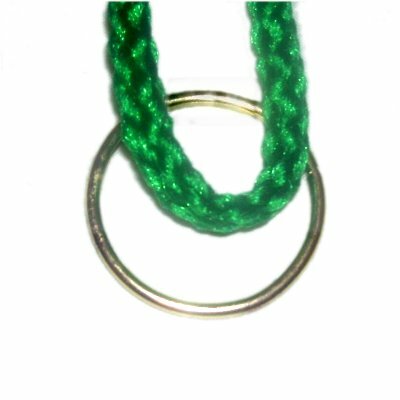 Move the rings closer together as you tighten (see image below). Step 7: Tie a LEFT SK with cords 7 - 10, from the left ring. 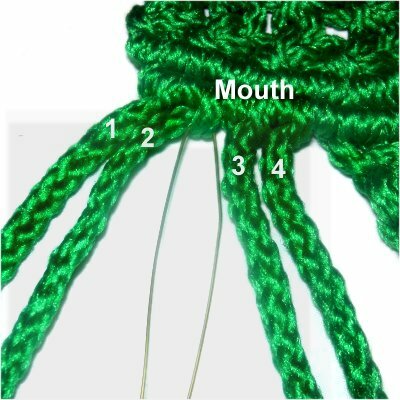 Tighten it firmly so it rests close to the first knot tied in step 6. 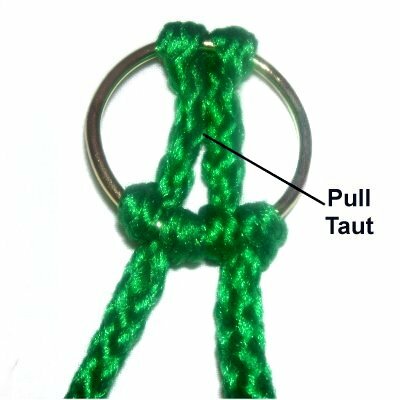 Tie a RIGHT SK with cords 1 - 4 from the right ring. Whenever you tie a RIGHT SK, you begin by curving the right working cord. In this case, that's cord 4. For a LEFT SK, you start with the working cord on the left. 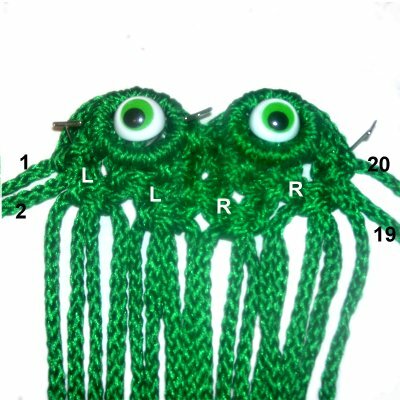 Changing the direction of the knots will ensure the Frog Holder is symmetrical on both sides. Step 8: To make row 3, mentally number all the cords from left to right. Tie LEFT SK with cords 1 - 4, 5 - 8, and 9 - 12. Tie RIGHT SK with cords 13 - 16 and 17 - 20. Step 9: Tie LEFT SK with cords 3 - 6 and 7 - 10 to begin row 4. Tie RIGHT SK with cords 11 - 14 and 15 - 18. Step 10: Add 1 cord to the left side of the Frog Holder by folding it in half and sliding it under cords 1 - 2. Tie a LEFT SK using the two halves of the new cord. Cords 1 and 2 are the fillers. Step 11: Add 1 cord to the right side by folding it in half and sliding it under cords 19 and 20. Tie a RIGHT SK with the new cord. Cords 19 and 20 are the fillers. 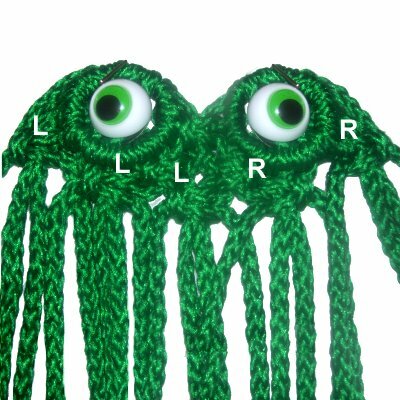 Mentally re-number the cords 1 - 24. 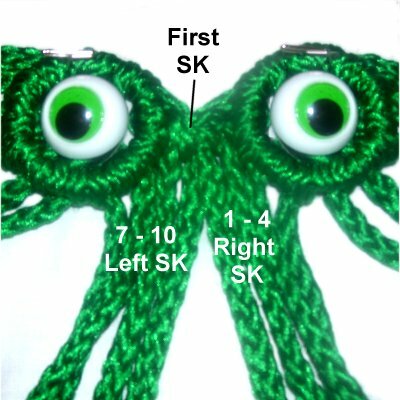 Step 12: To begin row 5, tie the LEFT SK using cords 3 - 6, 7 - 10, and 11 - 14. Tie the RIGHT SK using cords 15 - 18 and 19 - 22. Step 13: Repeat step 10, adding a new cord to cords 1 and 2 with a LEFT SK. Repeat Step 11, adding a new cord to cords 23 and 24 with a RIGHT SK. Step 14: Mentally re-number the cords 1 - 28. For row 6, tie LEFT SK with cords 3 - 6, 7 - 10, and 11 - 14. Tie RIGHT SK with cords 15 - 18, 19 - 22, and 23 - 26. 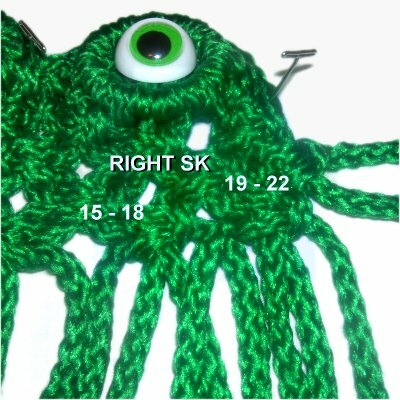 Step 15: For row 7, tie the LEFT SK with cords 5 - 8, 9 - 12, and 13 - 16. Tie RIGHT SK with cords 17 - 20 and 21 - 24. Tie LEFT SK with cords 7 - 10 and 11 - 14. Tie RIGHT SK with cords 15 - 18 and 19 - 22. 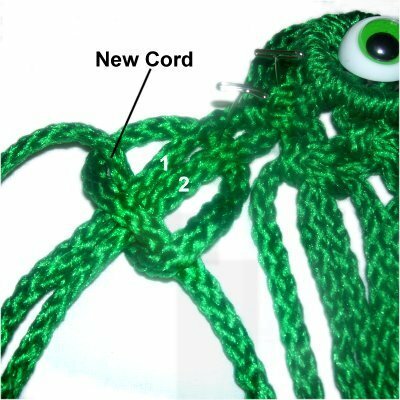 Step 17: Move cord 1 to the right, to be used as a holding cord for the mouth of your Frog Holder. Secure it so it's taut. Attach cords 2 - 14 to it with counter-clockwise DHH, tightening each one firmly. Move the holding cord to follow the curve of the Square Knots. 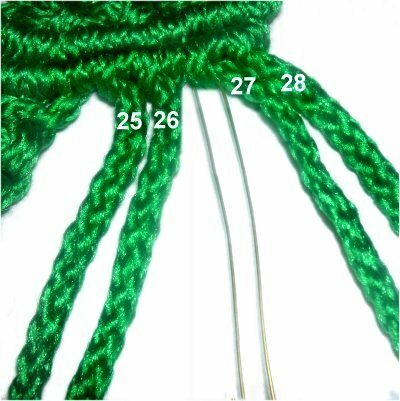 Step 17, continued: Move cord 28 to the left, to be used as the holding cord on the right. Attach cords 27 - 15 to it with clockwise DHH, in that order. Step 18: Combine holding cords 1 and 28 with cords 14 and 15, and tie one Square Knot. 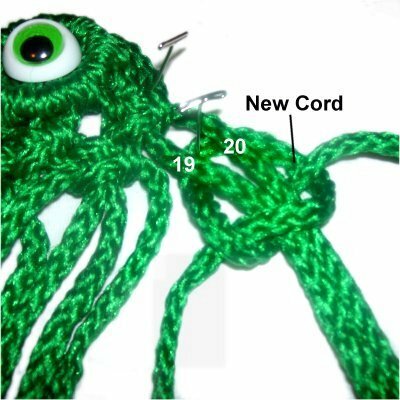 Step 19: Move cord 1 to the right, to be used as a holding cord for the lower lip of the Frog Holder. Attach cords 2 - 5 to it with counter-clockwise DHH, pulling each cord firmly so the two rows are close together. Step 19, continued: Attach cords 6 - 14, gradually increasing the space between the two rows of DHH. When you reach the center, the DHH should rest against the SK, so pull the cords firmly in that area. Rows 1, 3, 5, 7: Tie LEFT SK with cords 9 - 12 and 13 - 16. Tie RIGHT SK with cords 17 - 20. For rows 2, 4, 6: Tie LEFT SK with cords 3 - 6 and 7 - 10. Tie RIGHT SK with 11 - 14 and 15 - 18. Step 21: Now you will make the front legs for your Frog Holder. 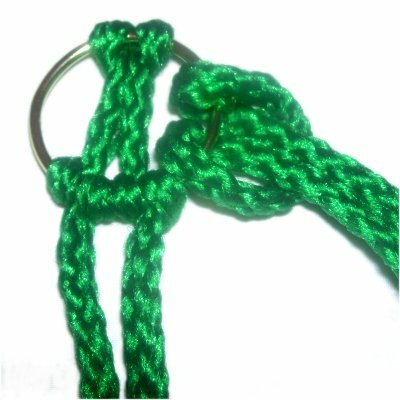 Tie a sennit of 9 Square knots using cords 5 - 8. Push the knots close together as you progress. Important: Make sure there are no gaps between the first SK and the DHH. The sennit will rest on an angle, heading outward. When the legs are attached to the ring, they will curve. Repeat this process with cords 21 - 24. 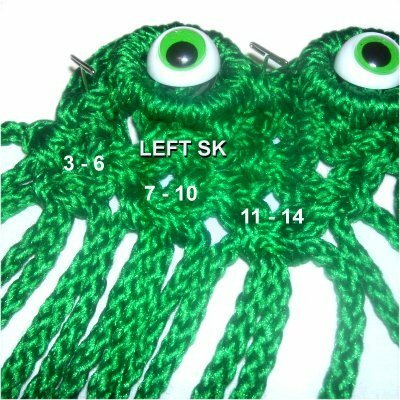 Place the 7-inch ring (or branch) against the last row of SK in the body. The front legs should touch the ring in the area next to the body (see image below). Tie additional knots if necessary. 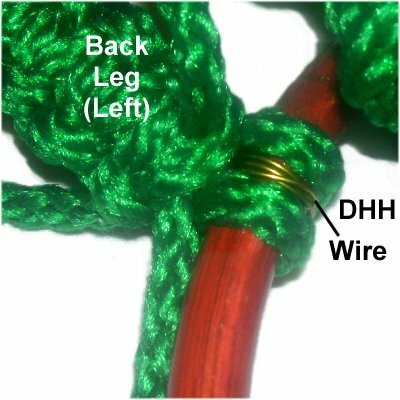 Step 22: Place cord 7 (left leg) under the ring, then attach it with a DHH. 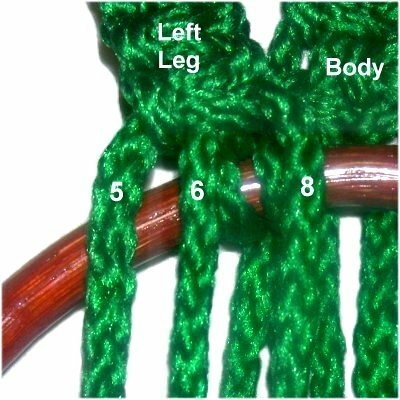 Cord 8 should rest close to the body. Do the same with cord 22 (right leg), attaching it on the right. 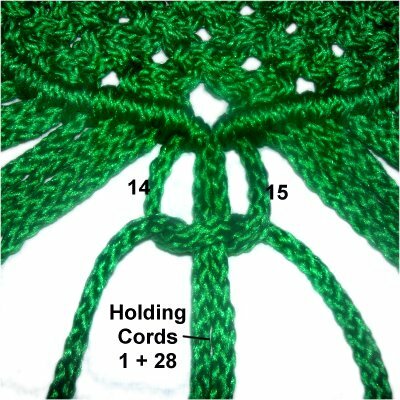 Cord 21 should be close to the body. Step 23: To start the left back leg for your Frog Holder, cut one piece of wire, at least 25 inches long. Slide it through the DHH made with cord 2 (left side of mouth), and fold it in half. 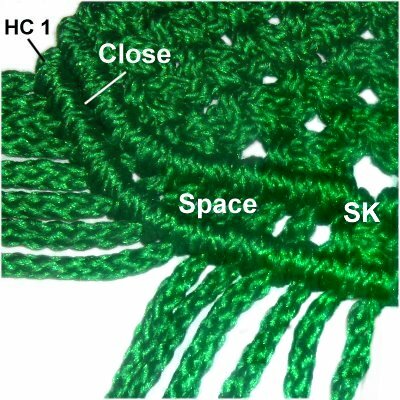 Tie a sennit of 18 SK with working cords 1 and 4. The fillers are cords 2 - 3 (and both halves of the wire). Step 24: Cut another 25-inch piece of wire, and slide it through the DHH made by cord 27 (right side of mouth). Tie a sennit of 18 SK with working cords 25 and 28. Include the wire as part of the fillers. Step 25: Go back to the left front leg and arrange cords 5, 6, and 8 on top of the ring. These are the holding cords for the foot, so secure them with tension. 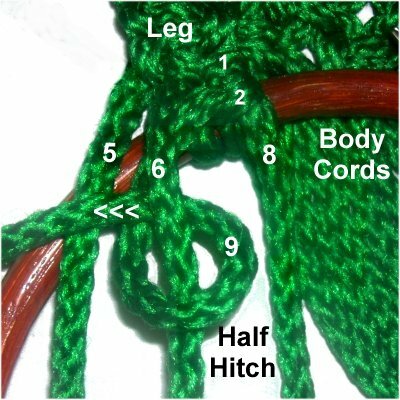 The working cords for the foot are the first 6 body cords (9 - 14). Make sure the leg and body are resting close together. 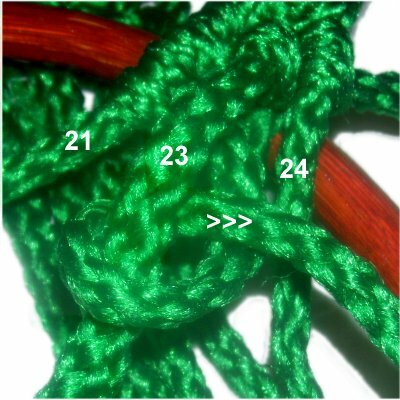 Step 26: Pass working cord 9 under the ring, and under holding cord 8 (from the leg). Tie a VERTICAL DHH onto cord 8, rotating counter-clockwise, so the end is always heading right to left. 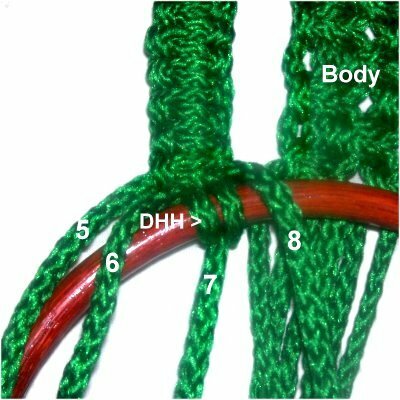 When making DHH vertically, the second knot rests below the first (1-2 on image below). Pass cord 9 under cord 6, and tie the next Vertical DHH. Pass cord 9 under cord 5, and tie the final DHH. 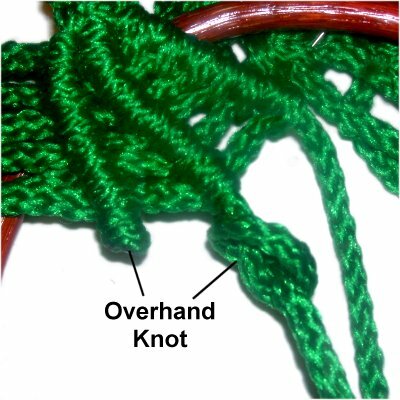 All three knots should rest close together. Step 27: Repeat step 26 with working cords 10 - 14, to make additional rows of Vertical DHH. Increase the space between the knots by moving the holding cords further apart after you tie each row. Step 28: Finish off the holding cords by tying an Overhand knot with each one, positioning it close to the last row of DHH. Apply glue while tightening. Cut off the excess material when it's dry. When using Bonnie Braid, you can apply a flame to the stub to melt the material. Step 29: Repeat steps 25 - 28 to make the right front foot. Use cords 21, 23, 24 from the SK sennit (right leg), as the holding cords. Use body cords 20 - 15 (in that order) to tie the rows of Vertical DHH. The Half Hitches are tied in a clockwise direction, since you are moving left to right. Step 30: Bend the left back leg at the area where the 6th and 7th SK rests. Check to make sure the sennit reaches the ring with the leg bent. Add extra SK if needed. 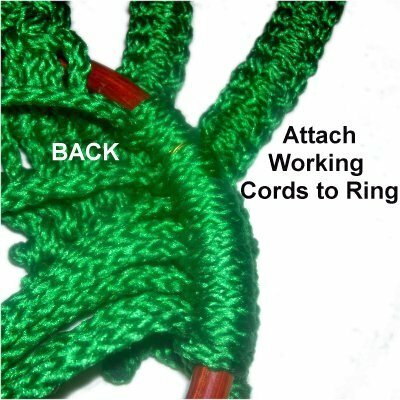 Attach the leg to the ring by wrapping the wire around it. Attach one of the cords to it as well. Try to place the DHH around the wire, with one loop on each side. Slide the knot close to the other leg. Step 31: Place the three remaining cords from the back leg on top of the ring, to be used as holding cords. Create the webbed foot as you did in steps 26 - 28, using the same working cords coming from the front foot (body cords 9 - 14). See more information below. Important: The feet for the Frog Holder look better if they are close together. 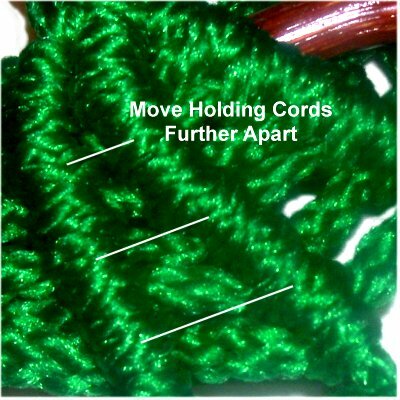 So arrange holding cord 4 next to cord 5 from the front foot, and tighten the Vertical DHH firmly so there is no space between them. Step 32: Repeat steps 30 - 31 to attach the right back leg to the ring and create the foot. 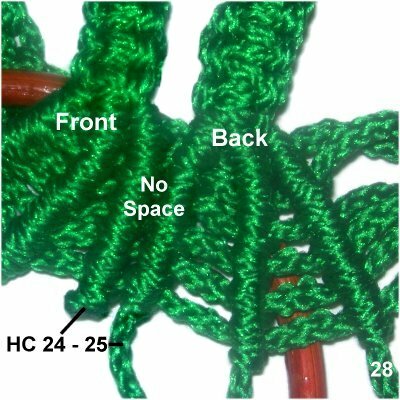 Holding cord 24 (front foot) should rest close to holding cord 25 (back foot), so there is no space between them. Use the same working cords coming from the front foot (body cords 20 - 15). Step 33: Turn over the Frog Holder so you are working in the back. Attach the working cords from the feet to the ring with DHH. This is optional, but will give the ring more support. Step 34: Finish off the cords by tying Overhand knots with sets of two cords. Apply glue and cut off the extra material. When using Bonnie Braid, you can fuse the tips with a flame. Have any comments about the Frog Holder? Contact Me.